Speaking with MTV, Terminator star Arnold Schwarzenegger discussed the newest entry in the franchise, Genesis, and not only gave away some major details about the movie, but also explained why the T-800 cyborg he plays will appear to look like a 66-year-old. "The way that the character is written, it's a machine underneath," Schwarzenegger continued. "It's this metal skeleton. But above that is human flesh. And the Terminator's flesh ages, just like any other human being's flesh. Maybe not as fast. But it definitely ages." Okay, I can buy that. More interestingly, Schwarzenegger reveals there will be newer T-800s in the movie as well, fresh off the assembly line and looking like like Schwarzenegger back in his 30s, much like in Terminator Salvation. 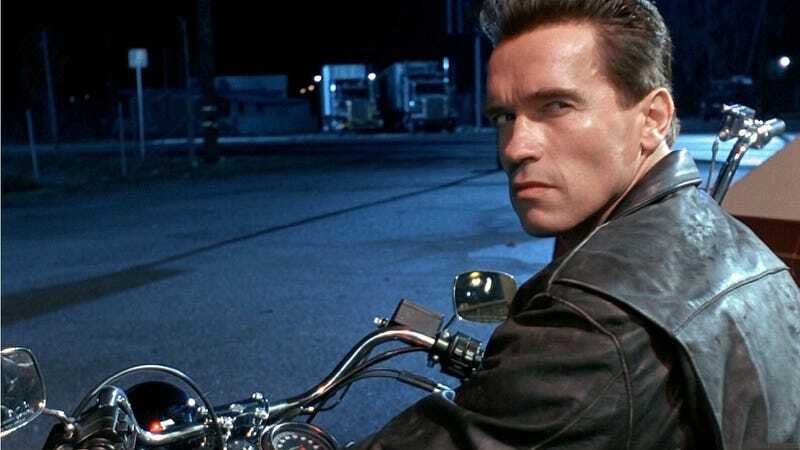 "Terminator deals a lot with time travel, so there will be a younger T-800," Schwarzenegger added, blowing our minds, "and then what that model does later on when it gets reprogrammed, and who gets ahold of him. So it will be all kinds of interesting twists in the movie, but I feel so good." This... this actually sounds pretty awesome. An old T-800 fighting off a legion of young T-800s? Yes, please. How awesome would it be if there were a young Robert Patrick-y T-1000 or twp running around, too? Oh man, suddenly Terminator: Genesis' May 15th, 2015, premiere date seems way too long to wait. There's a bit more and the interview footage itself over at MTV.